Less than an inch long. Mini Handcuff Key is non-metallic and can be stashed anywhere. Can be concealed anywhere to combat unlawful restraint. Best hide-a-handcuff key available. 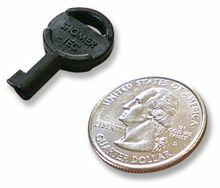 Constructed of a special durable composite, this universal key can be there for you when you need it most. Tiny, lightweight and non-metallic, it can be hidden on or about your body or clothing so that it can not be easily detected, yet be ready for your use if needed. The design features a lanyard hole so that it can be sewn into or suspended in your clothing or gear. A must-have item for anyone working undercover or operating in a hostile environment. Color: black. Size: 0.5" x 0.8". Weight: 0.014 oz. Made in U.S.A.